Not surprisingly, the market encountered some resistance at the all-time-high, making yesterday the first down day the market has seen since the Truman Administration. At least, it seemed that way... but it's probably been longer. There is some room in the charts for near-term bearish movement, but right now the decline is only an abc sequence, so bears will need another new low to begin thinking in terms of a more meaningful correction. 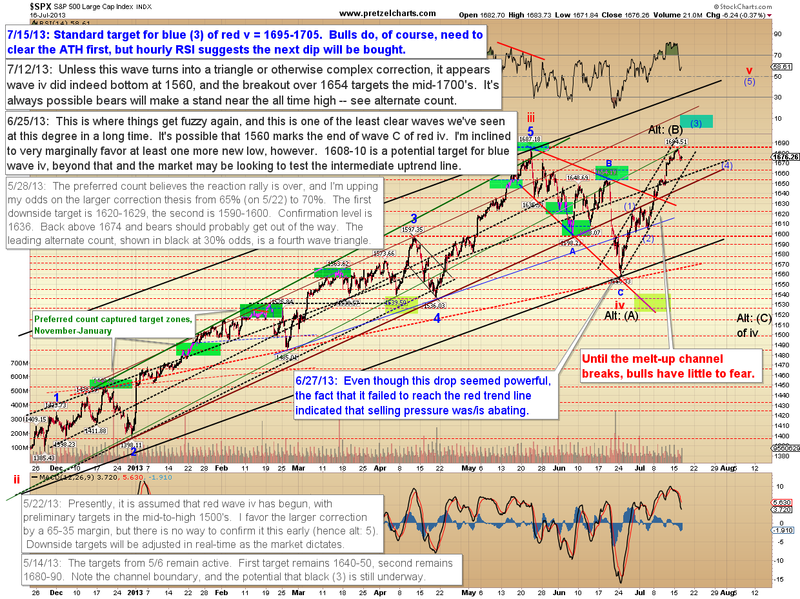 The near-term chart below outlines some key short-term levels and contingent targets. If we see a solid new low (shown as gray (5)), then we'll begin anticipating the next bounce will be followed by another leg lower for the near-term (gray ABC). 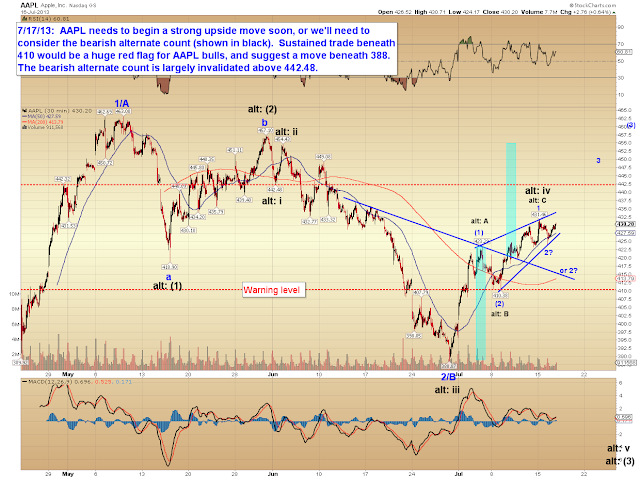 Stepping back a time frame, I'm inclined to believe that we're still in blue wave (3) until the market says otherwise. Note the bearish alternate count remains viable as the all-time high is still intact. I'd also like to share a long-term count I've been tracking for a while in the Nasdaq Composite (COMPQ). 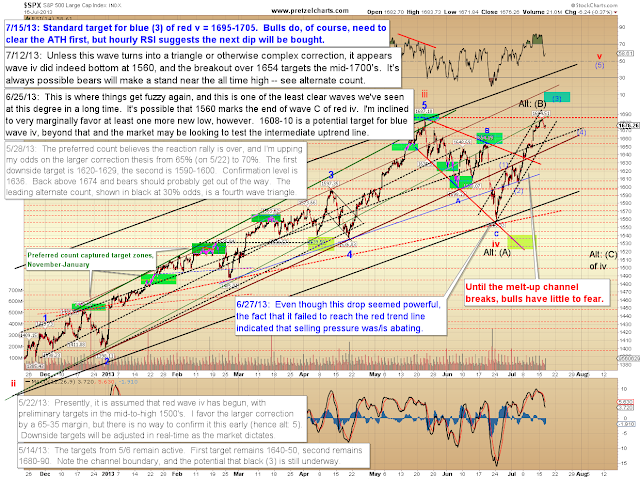 The unique perspective that the Nasdaq affords is that we know, without a doubt, to expect a five-wave rally. In SPX and many other indices, we really don't know which long-term structure to anticipate -- either an ABC or an impulse wave. But because Nasdaq is still recovering from the tech crash, and is clearly in a c-wave, we know to expect an impulsive upwards move. Note the Nasdaq recently reached the 61.8% retrace of the tech crash, which is always a good spot for a correction to begin. 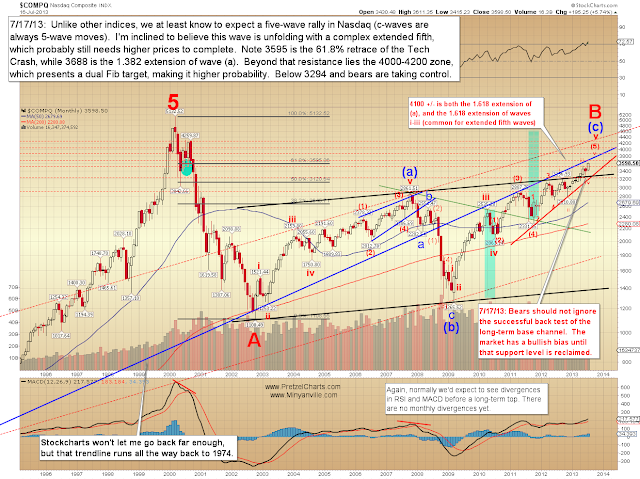 Ultimately, it appears more likely that Nasdaq has higher prices in store for the long-term, and the 4000-4200 zone presents targets at two wave degrees, so assuming we can get through current resistance, that may be the next spot to watch. Of note, my preferred count for Nasdaq has us in wave v of (5) of v -- which means it's anticipated to be the last leg up at multiple wave degrees. This also means that it has already completed the minimum expectations of a fifth wave (having reached a new high), so there's no room for complacency heading forward. I'd also like to briefly update Apple (AAPL). 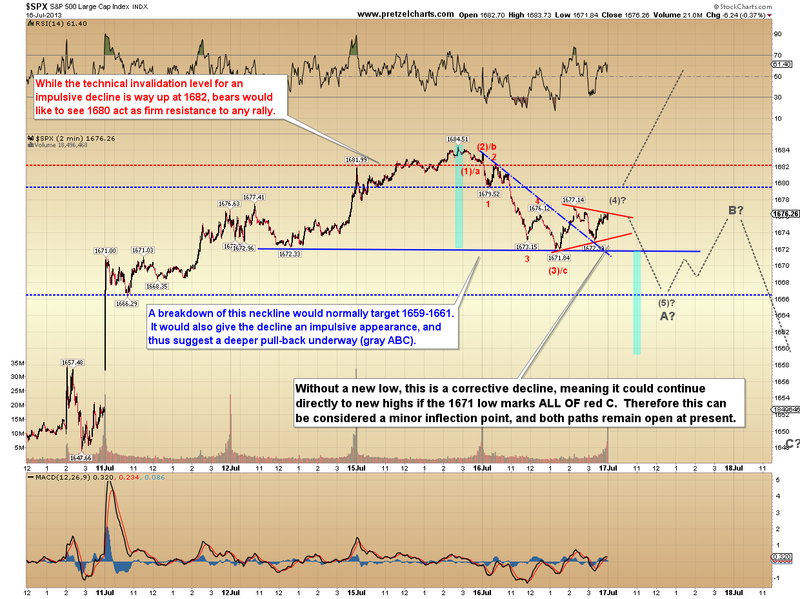 Apple has performed well and tacked on about 20 points since I suggested it as a long play on July 8. Since we timed this entry properly, we can either take profits or move stops up to roughly break even, thereby limiting or eliminating risk. 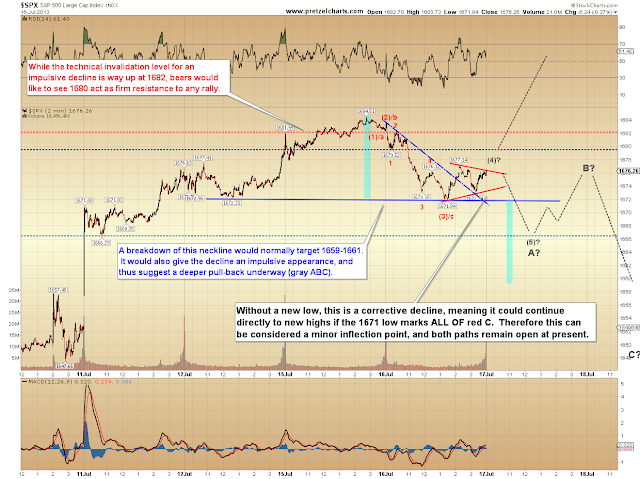 In any case, AAPL has reached an inflection point, so I'd like to talk about the other side of the trade in more detail. I'm still favoring the bulls for Apple, and the preferred count is a bullish nest of first and second waves, which would lead to a strong rally in a nested third wave. The only thing bothering me for AAPL is the rising wedge shape it's taken, but it's not uncommon to see this structure before a strong rally. However, it needs to launch out of that wedge with authority to validate the bull case; and the longer it hangs around current price levels, the more cautious I become. I view the bearish wave count as roughly a 40% underdog, but Apple has now completed a potential ABC rally, so it needs to be watched closely for the moment. 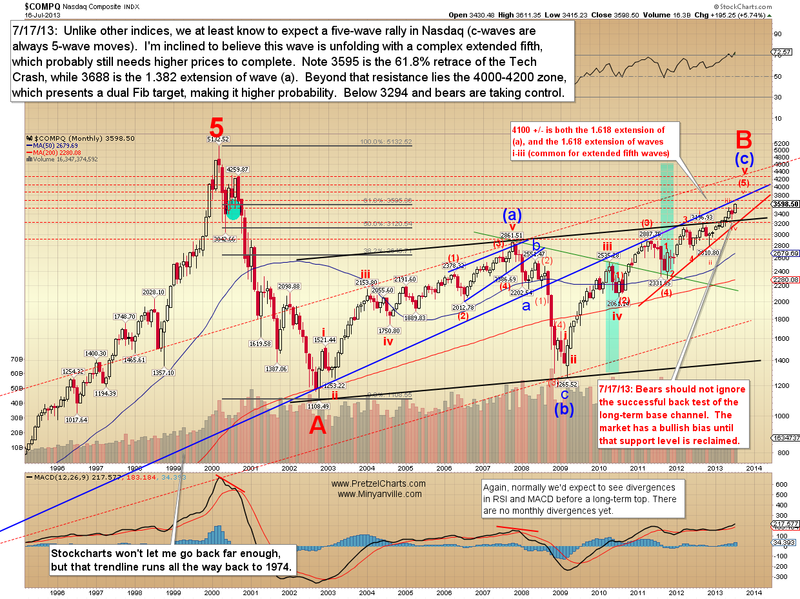 In conclusion, the trends remain pointed up for the time being, but the market has reached an inflection point, and a new low would shift the near-term trend. And that always leaves open the possibility of a larger trend shift underway, though it currently appears more likely that the market will head on to new highs after this correction completes. Trade safe.